Once there was a very rich magician who had a great many sheep. But at the same time this magician was very mean. He did not want to hire shepherds, nor did he want to erect a fence about the pasture where his sheep were grazing. The sheep consequently often wandered into the forest, fell into ravines, and so on, and above all they ran away, for they knew that the magician wanted their flesh and skins and this they did not like. At last the magician found a remedy. He hypnotized his sheep and suggested to them first of all that they were immortal and that no harm was being done to them when they were skinned, that, on the contrary, it would be very good for them and even pleasant; secondly, he suggested that the magician was a good master who loved his flock so much that he was ready to do anything in the world for them; and in the third place, he suggested to them that if anything at all were going to happen to them it was not going to happen just then, at any rate not that day, and therefore they had no need to think about it. Further, the magician suggested to his sheep that they were not sheep at all; to some of them he suggested that they were lions, to others that they were eagles, to others that they were men, and to others that they were magicians. And after this, all his cares and worries about the sheep came to an end. They never ran away again but quietly awaited the time when the magician would require their flesh and their skins. In modern times, the sheep are known in various ways -- as employees, customers, constituents, and the faithful. The employees are given titles and the ability to incur a mortgage and car loan, customers are given bargains, constituents are given hope, and the faithful are promised a better life after death. The majority live with their inherited world view and graze on stories until life has ended. We know it's a delusion; we know we've been screwed. But, we feel helpless and we create more stories to account for the other stories we can't control. Meanwhile, we cherish our titles, our consumer goods, and seek to live and work at addresses acceptable for our station in life. We argue our politics and religions and feel a little better than the next person about them. We hope that life will soon return to normal. We put our heads down, go back to work, and continue grazing. We trust that someone will fix the problems so that our story can have a happy ending. The magicians are known to us -- big business, government, special interest groups and religions. The power to create the illusion shifts from one to the other. Currently, it seems that the giant multi-national business --"Business without Borders" -- has the upper hand in writing the scripts. They have convinced us that a platinum-colored piece of plastic in our wallet bestows greater powers than a gold-colored piece of plastic and so we rack up points and pay the fees and ignore the phrase "* Some Restrictions May Apply". We believe that our tennis shoes will bestow special athletic prowess because others who possess such powers display the same corporate symbols to the camera. We believe our ideals and way of life are so much better than those of another culture that we are compelled to export our will for their benefit. Meanwhile, the banks pillage the national trust, the tennis shoes are manufactured in over-seas child labor camps and the defense industries lobby congress for new ideals worth having other people die for. We know these realities and more, yet we choose to feed the illusion. We allow ourselves to become entangled by these larger-than-life non-human entities because we find their stories more compelling than our own -- perhaps it points to a lack of confidence in our own worth. We serve large banks by working all month to pay them the interest on our mortgages and our credit cards. Then we pay our taxes so that we can bail them out when they fail. The banks reply to critics saying that no one forces the customer to use their credit cards and absorb their fees. They are correct -- WE LIVE IN CHOICE. We need to remind ourselves of that. The Supreme Court recently granted impunity to "Business without Borders" by overturning limits on campaign contributions -- effectively giving business entities unlimited powers to influence the voting rights of the individual. "Business without Borders" is in the driver's seat. The Wall Street Banks and Defense contractors control congress through lobbyists and former employees in key government positions. One can become very wealthy by creating stories that are better than the ones we write for ourselves. We have created a society and the system works in many ways -- and it is evolving to address others. In almost every case, the non-human entities begin with good intention. Most businesses start out intending to make a profit by supplying a market need, special interest groups usually represent identified worthwhile causes, and religions seek to bring us closer to the divine. 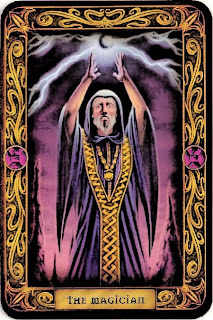 But, the dark forces - the magician - can arise during the evolution of any organization. The organizations become too big, too efficient, too centered on its leaders. In the single-minded focus on profits, business grows in efficiency until it ultimately serves only the leaders and shareholders of the company. The magicians function in the shadows of the collective unconscious. They trade in confusion, exploitation, and insecurity. What would you be without the magicians?